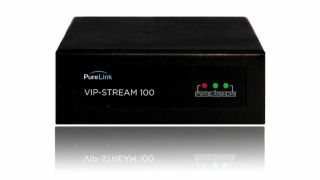 The What: PureLink has added a new HD video streaming encoder to its PureStream VIP line of AV-over-IP products. The VIP-STREAM-100 provides 1080p at 60Hz video and audio distribution over IP networks using the H.264 video compression standard. The What Else: The VIP-STREAM-100 is compatible with HTTP, UDP, RTSP, RTMP, and ONVIF protocols and offers live broadcasting via YouTube, Facebook, and other live streaming platforms. Using the H.264 codec allows the VIP-STREAM-100 to achieve high-quality video with relatively low bitrates. The H.264 standard offers similar video quality to MPEG2 and MPEG4, but at half the size of those older formats. Its common use throughout the industry allows the H.264-encoded multicast stream generated by the VIP-STREAM-100 to be decoded with any H.264-compliant soft-codec program, such as the free and widely available VLC Media Player. The product connects directly to source devices such as PCs, cameras, and set-top boxes and can stream live video feeds to content delivery networks or directly to a computer or other device found on the network.